Original Antique Maps and Prints. Description: This antique map was published in London ca. Pinkerton's now rare elephant folio atlas is one of the best engraved works of the period. While lesser known than the more common atlases by Cary & Thomson, it is a superior work, especially in the detail of the maps. Artists and Engravers: John Pinkerton (1758 ï¿½ 1826) was a Scottish antiquarian, cartographer, author, numismatist, historian, and early advocate of Germanic racial supremacy theory. Subject: Map:'Abyssinia Nubia &c. Highly detailed map, extending from the Great Desert of Selima and Kuku to Donga and the Dominons of a princes called Ibbe, Caffa (a Christian State), Bali and the Gulf of Aden. Nice detail along the Red Sea and the Upper Nile, its sources and the Cataracts, etc. Highly detailed regional map, one of the best regional maps of the area to appear in an English Atlas during the period. Condition: Size (in cm): The overall size is ca. The image size is ca. 69.5 x 50.5 cm. Size (in inch): The overall size is ca. 31.1 x 21.7 inch. 27.4 x 19.9 inch. Medium: Engraving / etching on a vellin type paper. ThePrintsCollector Peter Cornelissen, Margo van Latum - van Dongen, Frank van Latum Zeeland - The Netherlands. We guarantee our items to be genuine original. Visit our Store: we would like to invite you to review similar items in our Store or to browse through all other items in our Store. We are confident that you will find very special unique antique maps and prints in our Store. It is our privilege to have you as a customer. 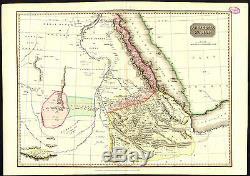 The item "Antique Map-ABYSSINIA-NUBIA-ETHIOPIA-SUDAN-EGYPT-GULF OF ADEN-Pinkerton-1814" is in sale since Friday, October 30, 2015. This item is in the category "Antiques\Maps, Atlases & Globes\Africa Maps".